6 Way 13amp PDU Extension Switch. Vertical mounting PDU for network cabinets. Standard UK type sockets; rated 13A; 6 Way. Health & Beauty. Protected neon On/Off Switch. Usefull Link. Vehicle Parts & Accessories. Unfiltered electrical pass-through and lighted switch with latching safety cover prevent the risk of accidental turn-off. Includes 15-foot AC power cord, 15-amp circuit breaker. 20 Outlet Power Strip - 19" Rack Mount. EMI/RFI filtering, built-in surge and spike suppression. Type of Receptacle: NEMA 5-1520R (15A 125V) Black Outlet. No software installation is needed. Type 3 Surge Protective Devices block lower level surges that are damaging to sensitive electronics such as TVs, computers and smart appliances. 1x Tripp Lite PDU1230 - Previously Owned. PREVIOUSLY OWNED, TESTED FOR KEY FUNCTIONS = Tested for Key Functions, R2/Ready for Resale. FACTORY SEALED, NEW OPEN BOX, REFURBISHED = Tested for Full Functions, R2/Ready for Reuse. Southeastern data has over 22 years experience! Manufacturers Model: 3T767 AP6030. 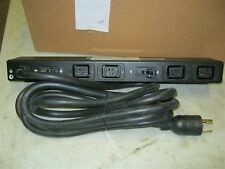 1 Dell P/N 3T767 Power Strip. Manufacturer: Dell. The cost is double the single price for two triple for three ect ect. · Ground Wire with screws. 1 Installation Guide Manual 120 pages (aprox 20 pages in 5 languages). Features network grade AC surge suppression with EMI/RFI noise filtering. Includes (12) outlets (2 front/10 rear), 15ft AC power cord and lighted Combo Switch / Circuit Breaker. 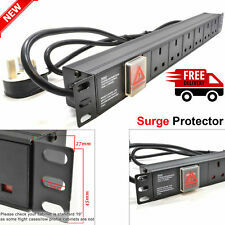 Unlike other manufactures product, this power strip gives a constant display of the 3 most critical points on a surge protector. The AP7822 has twelve (12) IEC-C13, four (4) IEC-C19 outlets, one (1) IEC 309 32A input and the digital display shows aggregate current being used per phase by the PDU. Item#: 9860. C. RE-REBUILT OR REFURBISHED. INSPECTION AND ACCEPTANCE OF PRODUCT. Finally, it includes classifying each item pursuant to a condition code. LIMITATION OF LIABILITY. Furniture Power Distribution. HP Series #:EO4501. HP Part #:228481-002. HP Spare #:252635-001. You are buying on a HP 24A HV Core only Corded PDU 420-11160 Part Number: 252663-D74. Feed Back Policy. Pictures shown above are original pictures. Unpaid item (UPI) complaint will be filed with e Bay upon non-. Item#: 9872. C. RE-REBUILT OR REFURBISHED. Retractable Power / Communication Center. This item could be several years old and may not be the most recent model, but it has never been placed in service. Item#: 9873. Manufacturer: Byrne. 15A, 125V, 60Hz. C. RE-REBUILT OR REFURBISHED. Retractable Power Center. This item could be several years old and may not be the most recent model, but it has never been placed in service. This has never been used but has no leads or box. Item#: 9885. 1-Outlet, 1-Blank, Hardwire, 20A, 125V. LIMITATION OF LIABILITY. Finally, it includes classifying each item pursuant to a condition code. INSPECTION AND ACCEPTANCE OF PRODUCT. HOURS OF OPERATION. Item#: 9886. 2-Outlet, Corded, 15A, 125V, 60Hz, White. INSPECTION AND ACCEPTANCE OF PRODUCT. LIMITATION OF LIABILITY. C. RE-REBUILT OR REFURBISHED. HOURS OF OPERATION Finally, it includes classifying each item pursuant to a condition code. 30A 220V-PDU for Bitcoin, AntMiners, Ethereum, cryptocurrency mining servers. Each PDU can handle a max Input current of 30A. Commonly Used in Crypto Currency Mining Farms, but can be used for any other purpose that one desires. Unit has tiny scuff marks from past use. This item was pulled from use in WORKING ORDER and is in GOOD PHYSICAL CONDITION. IF IT IS NOT IN THE PIC, IT MAY NOT BE INCLUDED! Axil Z Furniture Power Distribution. Item#: 9858. E. UAI- USED AS IS. Black, 2-Blank, 2-Outlet, Corded. C. RE-REBUILT OR REFURBISHED. INSPECTION AND ACCEPTANCE OF PRODUCT. Finally, it includes classifying each item pursuant to a condition code. Unit rated at 115V, 20A 1Ø 50-60Hz. Middle Atlantic model # PD1020C-NS. Ultra low profile, space saving design. WE STRIVE TO ALWAYS GIVE ★ ★ ★ ★ ★SERVICE--NOTHING LESS! Has (10) 5-20R receptacles. Brennenstuhl 1153543134 Desktop-Power with switch and USB 2.0 4-way black 1,8m. Condition is New. Dispatched with Hermes Tracked. AXIL Z Power Center. Item#: 9881. E. UAI- USED AS IS. C. RE-REBUILT OR REFURBISHED. This item could be several years old and may not be the most recent model, but it has never been placed in service. Ellora, 12A, 120V, Gray / White, Interlink IQ, 2 - Outlet, 1 - HDMI, 1- Blank. Manufacturer: Byrne. Item#: 9901. C. RE-REBUILT OR REFURBISHED. INSPECTION AND ACCEPTANCE OF PRODUCT. LIMITATION OF LIABILITY. Interlink IQ, Ellora, black, 2-Outlet, 1-2 port USB. Item#: 9844. Manufacturer: Byrne. C. RE-REBUILT OR REFURBISHED. INSPECTION AND ACCEPTANCE OF PRODUCT. LIMITATION OF LIABILITY. Finally, it includes classifying each item pursuant to a condition code. Item#: 9851. Hardwire, 2-Outlet, 1-HDMI, 1-Blank, 20A, 125V, Silver / White. Manufacturer: Byrne. C. RE-REBUILT OR REFURBISHED. This item could be several years old and may not be the most recent model, but it has never been placed in service. APC model # AP8858NA3. Includes Power cord with L6-20 plug. Has (18) C-13 and (2) C-19 receptacles. WE STRIVE TO ALWAYS GIVE ★ ★ ★ ★ ★SERVICE--NOTHING LESS! Ultra low profile, space saving design. Eine gebrauchte Steckdosenleiste von Rittal. Das Symbol der durchgestrichenen Abfalltonne auf Rädern bedeutet, dass Altgeräte einer vom unsortierten Siedlungsabfall getrennten Erfassung zuzuführen sind. 19" 6 WAY UK MAINS POWER DISTRIBUTION STRIP UNIT EXTENSION PDU.VIEC/6. BNIB. BRAND NEW IN BOX. NO PLUG FEMALE END. ASSYNIA 19" 6 WAY UK MAINS POWER DISTRIBUTION STRIP UNIT EXTENSION 06H/C14 BNIB. These PDU's are used but in full working order after being decommissioned from a working Data Centre and are just no longer required. EMC Simclar Rack PDU Power Strip PN: 100-885-137 E240869. This item is rated at 20A 120v 1Ø, it is easily rack-mountable, requiring 2U of rack space. This is one of their "Brick Wall" series of surge protectors. Location: C7A. WE STRIVE TO ALWAYS GIVE ★ ★ ★ ★ ★SERVICE--NOTHING LESS! Item#: 9865. Manufacturer: Byrne. Black, 1-Blank, 1-HDMI, 2-Outlet, 20A, 125V. LIMITATION OF LIABILITY. Finally, it includes classifying each item pursuant to a condition code. Multi-Outlet Assembly. • (1) - NEW LANTRONIX WIPORT WIRELESS WIFI 802.11B/G INTERFACE DEVICE SERVER NETWORKING ETHERNET 2-PORT RS-232 PCB BOARD WP2002000G-02 330-159-R-B WBX2100E. Only what is photoed is included. 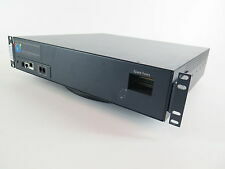 Server Tech Sentry CX-8H1A113 8-Plug 16A PIPS PDU Switched Cabinet Distribution. Condition is Used. Shipped with UPS Ground. It can also operate as stand alone unit. Pulled from close down data center. In great working condition. IPL Computer Center. We are located at 6373 US Hwy 50 E, Carson City NV 89701. UK mains plug input. Robust aluminium construction. 12x IEC-C13 output power sockets. Maximum Total Current Draw per Phase: 12A. New in Box. No software, power cords, batteries or accessories provided unless pictured. Item#: 9848. Ellora, 3-Outlet, 1-HDMI, 2-Blank, 15A, 125V, 60Hz. C. RE-REBUILT OR REFURBISHED. This item could be several years old and may not be the most recent model, but it has never been placed in service. Part # AP9562. - Rack mounts. Silver, Pop-Up, 2-Outlet, Glenbeigh. Item#: 9843 / 9856. Manufacturer: Byrne. C. RE-REBUILT OR REFURBISHED. INSPECTION AND ACCEPTANCE OF PRODUCT. LIMITATION OF LIABILITY. Finally, it includes classifying each item pursuant to a condition code. Item#: 9864. Black, 2-HDMI, 2-Cat6, 2-Outlet, Ellora. C. RE-REBUILT OR REFURBISHED. INSPECTION AND ACCEPTANCE OF PRODUCT. Furniture Power Data Distribution. Finally, it includes classifying each item pursuant to a condition code. Item#: 9875. Details: Universal Dock for iPod/iPhone. National Lighting. C. RE-REBUILT OR REFURBISHED. LIMITATION OF LIABILITY. This item could be several years old and may not be the most recent model, but it has never been placed in service.